So Easy to Find Us. 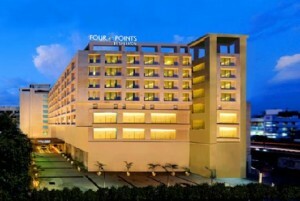 We invite you to discover Jaipur, the Pink City, and stay at Four Points by Sheraton Jaipur, City Square. Our hotel is located in the heart of Jaipur, convenient to major government and business organizations, universities and the new International Airport. The City Palace, Amber Fort, Hawa Mahal and other popular sightseeing attractions, are all within easy access of our hotel. Plus, we’re within walking distance of the city’s most notable shopping, restaurants, bars and movie theaters. Comfortable & Fun. Jump into the coziness of your Four Points by Sheraton Four Comfort(SM) Bed. Our 114 guest rooms or suites offer simple, uncomplicated convenience and value, including flat screen LCD TVs and High Speed Internet Access. Our fun, colourful all day dining restaurant, The Eatery, features both continental favourites and regional specialties. Why not drop by Bar Bar, our lounge, and sip on a cold beer from the world’s Best Brews(SM), while enjoying the views of the Aravali Hills. Accommodation in Comfort room for 2 nights and 3 days./ Meal as Per Plan and all applicable taxes./ Two children below 12 years complimentary in the same room without extra bed./ Complimentary usage of health club, steam and swimming pool./ Welcome drink on arrival./ Daily fruit platter, assorted cookies, and assorted chocolates./ 20% Discount on Food and Beverage including alcohol./20% Discount on ZIVA spa./ 20% Discount on Laundry. 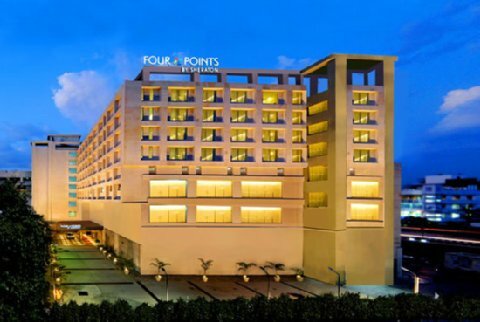 If you have not decided yet or wants to customize tour itinerary or hotels listed above in "5 Star Luxury Four Points by Sheraton Jaipur City Square Hotel in Jaipur", then we can change the travel itinerary and make a personalized, tailor-made holiday package, especially for you. We can modify this travel package as per your itinerary, budget, duration and the tourist places you would like to visit, including transportation and airfare should be included or not. Please fill the form below to contact us.